NECA - Batman VS Superman Dawn of Justice - 1/4 Scale Figure - 18 - Batman. From the action-packed movie Batman v Superman: Dawn of Justice, this 1/4 scale Batman action figure is almost as imposing as the Dark Knight himself! The figure stands just under 19 tall and has nearly 30 points of articulation for dynamic poses. Batman features plenty of movie-accurate detail and is sculpted with the likeness of actor Ben Affleck. 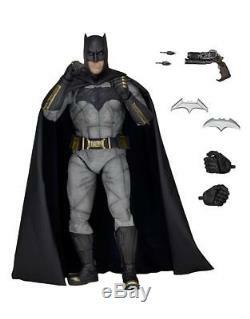 Comes with two sets of hands, two different Batarangs, and Grapnel accessory with a clip that allows it to be attached to Batmans belt. Please see the business contact details below. Emails and telephone calls will be answered ONLY from. Orders fulfilled from our 5000 Sq Ft UK warehouse and shop. Dedicated warehouse and sales team. Authorised stockists for many brands. Check us out online or visit instore! The item "NECA Batman VS Superman Dawn of Justice 1/4 Scale Figure 18 Batman" is in sale since Friday, July 8, 2016. This item is in the category "DVDs, Films & TV\Film Memorabilia\Figures/ Dolls". The seller is "safari-island" and is located in Warwickshire. This item can be shipped worldwide.